I have three projects in progress, which is unusual for me. The most fun are the Zen Waves socks (Ravelry link). This project had a troubled start. I did the toe quickly, stalled while I picked out a cable pattern, stalled again waiting for a fitting, and finally it took off. Having a doctor who was well over an HOUR late for our appointment helped the sock, though not my temper. The cable pattern is fascinating because the number of knit stitches changes from six to four and back again depending where you are in the pattern. I took the cable pattern from Barbara walker’s Second Treasury of Knitting Patterns (Twin Waves). 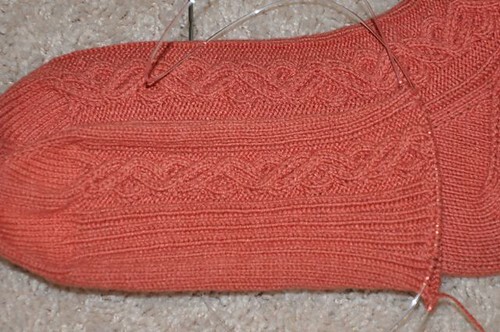 The cable pattern is reversed on the second sock and I hid some calf shaping in the purl columns on the back. This is my first pair of socks made with a true US1 (2.25mm) needle from Hiya Hiya. All the rest have used the Addi version of a US1, which is actually a US1.5 (2.5mm) needle by everyone else’s standards. I don’t know why Addi decided to go their own way on the sizing there. When I have the socks finished, I’m starting another blue lace scarf, Honeybunch (Ravelry link), and my karate instructor mentioned the golden bat she still wants. I’m still working on the blue Wollmeise lace scarf, but I haven’t done anything on the unspun silk neck cozy in a while. I’ve been itching to start knitting socks again… it’s been awhile… they are beautiful!